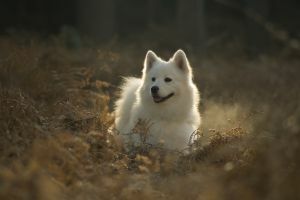 The Samoyed is one of the most popular dog breeds in North America. They are a Working Dog that was bred in the North. They were bred to work in a variety of tasks including sled dogs, guards, herding animals and as companions. They were heavily relied upon in many Arctic expeditions and are well regarded as a powerful sled dog. You might think that this breed is best as an outdoor dog. The truth is that most often they are best as indoor family pets! This is because they are very much used to being companion dogs. The Samoyed Dog Breed has a thick, water resistant, double coat. They often come in a mixture of biscuit and white coloring (or pure white or pure biscuit). Even though they have a thick coat they have little dander which makes them hypoallergenic dogs! If you live in a warmer area please keep them indoors in the warmer weather a they can not handle the hot weather. They have an energetic disposition. They have excellent stamina and need lots of exercise every day to prevent boredom and negative behavior. They will not make a good guard dog (even though that was an old job) because they are very friendly and gentle dogs. They are quite alert, loyal and energetic, but rarely aggressive. Please buy from a reputable breeder or adopt from a rescue or local animal shelter. If you properly care for your dog you can expect it to live 12-16 years.